The Trump administration has granted a six-month extension to nearly 60,000 Haitians who were offered temporary protection in the US after a devastating earthquake in 2010. The extension will allow them to remain in the US until January 2018. But a DHS official said the agency was encouraging Haitians on the TPS scheme to “get their affairs in order”. Immigration advocates have protested against deportations, saying conditions in Haiti remain too dangerous. The earthquake killed tens of thousands of Haitians and displaced more than one million, and the country has since been hit by a cholera epidemic. DHS officials who briefed reporters on the decision said only conditions seen as caused by the earthquake were taken into account in analysing Haiti’s readiness to accept the TPS residents back. They said no decision had been made over whether the TPS status would be extended again in January 2018, but that the agency “highly encouraged all TPS recipients to handle their affairs as appropriate, including obtaining travel documents”. 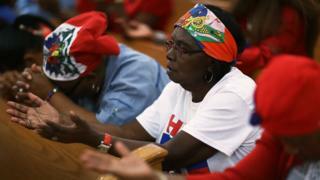 There are roughly 58,700 Haitians living in the US on the TPS scheme, many in a large Haitian community in Florida, as well as New York and Massachusetts. They will be required to reapply for TPS status within 60 days of official notice from the DHS. No new Haitians will be allowed to join the scheme during the extension period. “This is temporary status, it’s not supposed to be permanent. It can’t go on in perpetuity,” an official said. The government has already sought to deport some Haitians who don’t have TPS status, in line with part of a wider crackdown on illegal immigration. According to internal emails passed to the Associated Press earlier this month, immigration officials sought crime data on Haitians on the TPS scheme, as well as information about whether they were seeking benefits. The TPS scheme currently grants protections to nationals of 10 countries, including Sudan, Somalia, Syria, El Salvador, Nepal and Yemen.